Cory Hardrict stars in the movie Destined and it doesn’t look too bad. 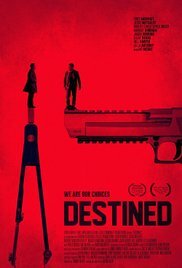 Destined tells two stories of Sheed and Rasheed both played by (Cory Hardrict). The film explores the idea of destiny and choices, and looks at life from different perspectives. The trailer shows just one scene but it’s a powerful one. I’m a little curious about what this film will bring. Check out the trailer let me know what you think? This entry was posted in Uncategorized and tagged cory hardrict, destined, films, movie. Bookmark the permalink.